On a recent visit to the Cooper Hewitt, some of the Homestead’s staff had the opportunity to see a Surtout de Table (Table centerpiece) made by Pierre-Philippe Thomire. It is said to have been a present from Napoleon to his stepson Eugène de Beauharnais. 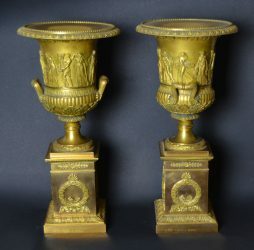 Elements from that piece are almost identical to those seen on this pair of ormolu urns from the Homestead’s collection, also by Thomire. Thomire worked almost exclusively with bronze ormolu, and was one of the most talented decorative artists of the period. He made several pieces on commission for Napoleon, some of the Emperor’s relatives, and even some pieces for the leaders of the Bourbon restoration who took control of France after the fall of Napoleon.